A variety of guns are seen in this file photo. CHICAGO — The top weapons seized by Chicago police off the streets were Ruger 9MM handguns, a new analysis shows. Using Chicago Police Department data from 2014, the web site The Trace created a top 20 list of guns seized, with the 9MM made by Strum, Ruger & Co. leading with 179. The company touts its 9MM models as "perfectly sized to be comfortable and controllable" and describes itself as "arms makers for responsible citizens." At number two was Smith and Wesson's .38 with 173 seized. Guns made by Smith and Wesson hold four of the top 20 positions. While many of the weapons are cheap, more expensive guns are being seized more and more. For example, Glocks, which go for $500 to $600 retail at gun dealers, are becoming increasingly popular on the street, The Trace data shows. "An influx of cash from the drug trade has allowed some gang members to purchase higher quality guns like Glocks, which they generally hold on to," according to the story. The Glock .40 is third on the list, with 151 seized. The Trace identifies itself as "an independent, nonprofit news organization dedicated to expanding coverage of guns in the United States." In a nationally televised forum earlier this month, President Barack Obama lamented the number of guns on the streets in Chicago. "Every week there's a story about a young person getting shot" in Chicago, Obama said. Studies on Chicago and illegal gun use say that most guns retrieved from crime scenes were originally sold at retail stores. 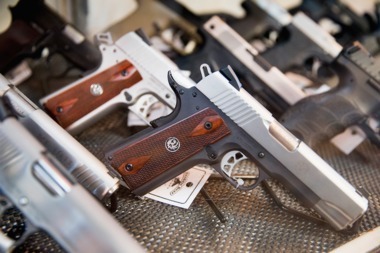 "Along the way, however, many guns are diverted into the hands of criminals through theft; “straw purchasing,” where a legal gun buyer is paid to purchase a gun for a gun trafficker or criminal; and private sales at gun shows and online, where sellers are not required by federal law to conduct background checks or keep paperwork on the gun transfer," according to a 2014 Chicago Police Department report on guns. Some six out of ten guns recovered from crime investigations come from states with weaker gun laws, the report said. Indiana, Mississippi, and Wisconsin, supplied 19 percent, 6.7 percent, and 3.6 percent of these crime guns, respectively, the report said. Some 4,505 guns were seized that were used in violent crimes, including murder, as well as during traffic stops in 2014, the Trace said.